Featuring uplifting stories including environmental breakthroughs, modern day heroes, progress toward a more sustainable planet and eco-friendly food, plus people who are making a difference in their communities. Producers Mikail Graham and Julia Boorinakis Harper have created a series of Good News Bites focusing on uplifting stories that showcase the positive aspects of life on this planet that are so often overlooked by the mainstream media. Host & producer Mikail Graham with guest host Phyllis Boorinakis. The Good News Show on KVMR : Uplifting stories including environmental breakthroughs, modern day heroes, progress toward a more sustainable planet and eco-friendly food, plus people who are making a difference in their communities. 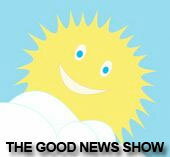 The Good News Bites project : Producers Mikail Graham and Julia Boorinakis Harper have created a series of Good News Bites focusing on uplifting stories that showcase the positive aspects of life on this planet that are so often overlooked by the mainstream media.